The online bookmaker Dafabet lists a few great promotional offers on their site, one of which gives their customers the chance to get a refund as a free bet, up to £50, if the player they have backed to score the first goal in a match fails to score the first, but goes on to score the second instead. As mentioned the maximum refund is £50 as a free bet, and in order to qualify for the offer you must place a minimum single bet of £1 on the First Goalscorer Market. You do not need to opt-in to this offer, which will save time. As with most online betting offers, there are terms and conditions you must abide by. Only bets made pre-match will qualify for the offer, so no bets made in-play will count. If you have placed a bet on a Dafabet ‘Price Boost’ market, you will not qualify. 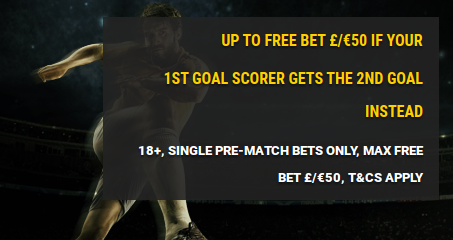 Your bet must also be a single, as bets included in an accumulator will not count towards the Second Goal Scorer Free Bet offer. It is important to always use real money stakes when you are looking to qualify, as any bets made with a free bet will not count. If you live outside of the UK or Ireland, unfortunately you will not be able to complete this offer. Please note that this offer cannot be used in conjunction with any other offer listed on the Dafabet website. If your bet is void or the match has been postponed for longer than two days, that bet will not count towards qualifying. It goes without saying, but an own goal will not count as a qualified goal for the offer. The offer is also limited to one time only availability per person/account/family/legal registered address/email address/telephone number/payment account (eg debit or credit card, Neteller etc)/IP address/shared computer environment. Thus, if your brother living at the same address for example wished to complete the offer, they would not be eligible if you had already used it. If you have successfully stayed within the terms, your free bet will be credited to your account by 7:00am on the following day. The free bet amount you are given is matched with your stake, up to the maximum £50. As is the case with most free bets, the free bet stake will not be included in any potential winnings. When matched betting, we need to look for close matches between the odds listed on Dafabet and those on the betting exchange. If we find close odds, it allows us to have numerous attempts at hitting the free bet refund, for minimal losses. The process is quite simple: place your qualifying bet and place the lay bet against that selection on the exchange, using the MatchedBets.com calculator to work out your lay stake. Then, if you hit the refund, use the same process but with the free bet stake instead when placing the back bet. With advantage play, this offer is worth around £3 each time. This offer is one of many promotions listed on MatchedBets.com. Premium members can benefit from this offer as well as many others, thanks to our step by step guides and industry leading experience. Dafabet are offering the chance to earn a refund, as a free bet, of up to £50 if you place a Correct Score or Half Time/Full Time Bet and the match ends in a goalless draw.